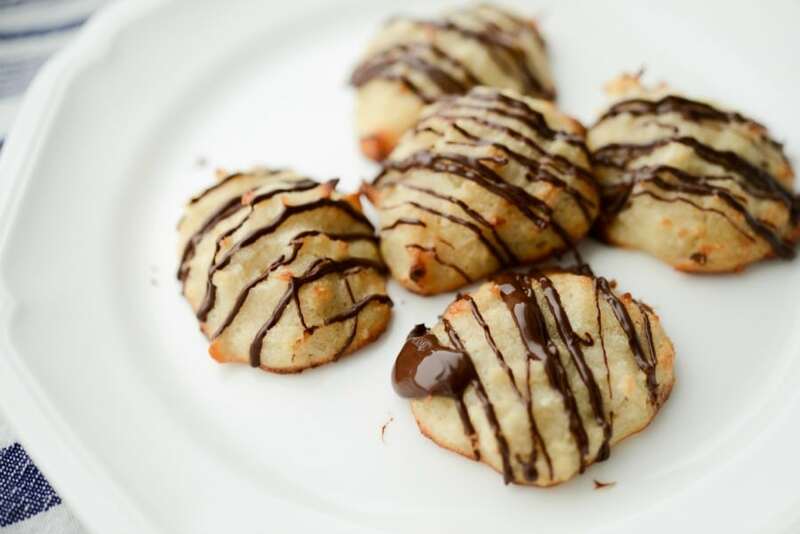 Chocolate Drizzled Coconut Macaroons made with almond flour, coconut and egg whites are a low carb dessert option when you’re craving something sweet. In our quest to eat ‘low carb’ lately, I’ve been craving sweets more than I ever did before. I guess that it’s because carbs=sugar and where I’m not getting them one way, my body is craving the sugar in other ways. 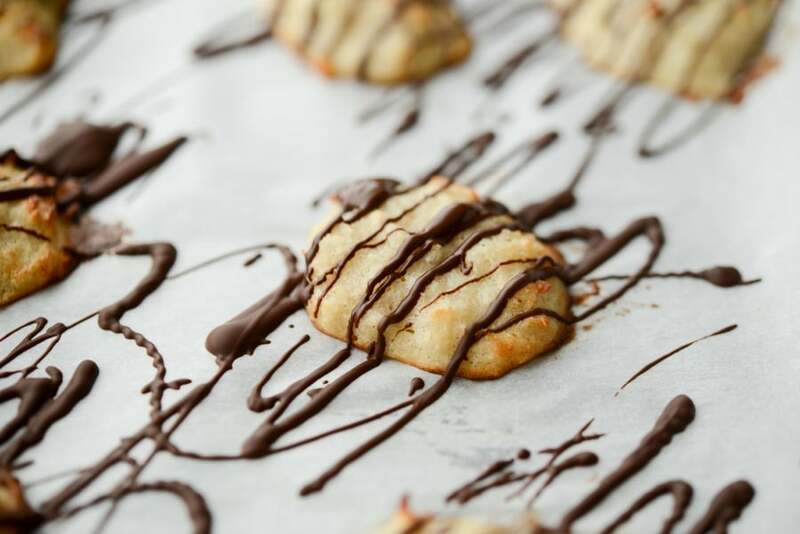 These Chocolate Drizzled Coconut Macaroons did just the trick! For this recipe you’ll need super fine almond flour, shredded coconut, stevia, vanilla extract, coconut oil, egg whites and dark chocolate. First, heat the oil until melted; then add the vanilla extract. Combine the flour, coconut and stevia in a mixing bowl; then add the oil mixture. In a separate bowl, whisk (either by hand or using an electric hand mixer) the egg whites until stiff peaks form; then gently fold them into the flour mixture. You do not want to over mix, just enough to moisten the dough. 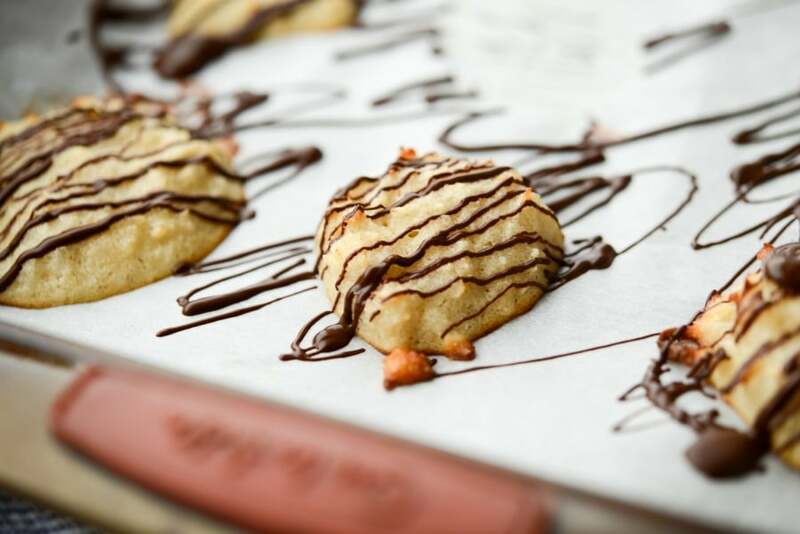 Drop a tablespoon of the mixture onto a non stick baking sheet or one that has been lined with parchment paper or a Silpat mat; then bake in a preheated 400 degree F oven for 7-8 minutes until the edges and tops turn golden brown. Remove from the oven and allow to cool completely. 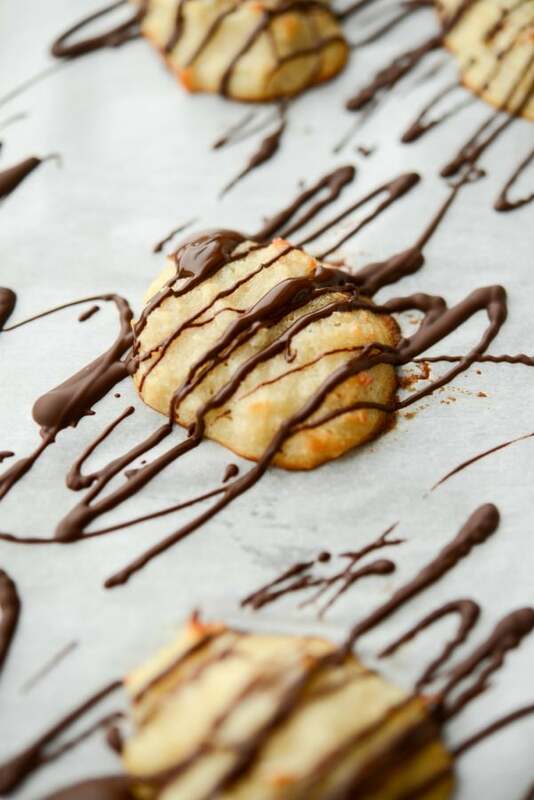 While the cookies are cooling, melt the chocolate using either a double boiler or in the microwave at 15 second increments; then drizzle the chocolate on top of the cookies. My husband and I loved these Chocolate Drizzled Coconut Macaroons and they were so light and airy. 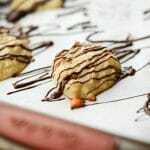 This recipe makes one dozen cookies and I wish I would have doubled the batch because they were so good and two cookies definitely satisfied my sweet cravings. 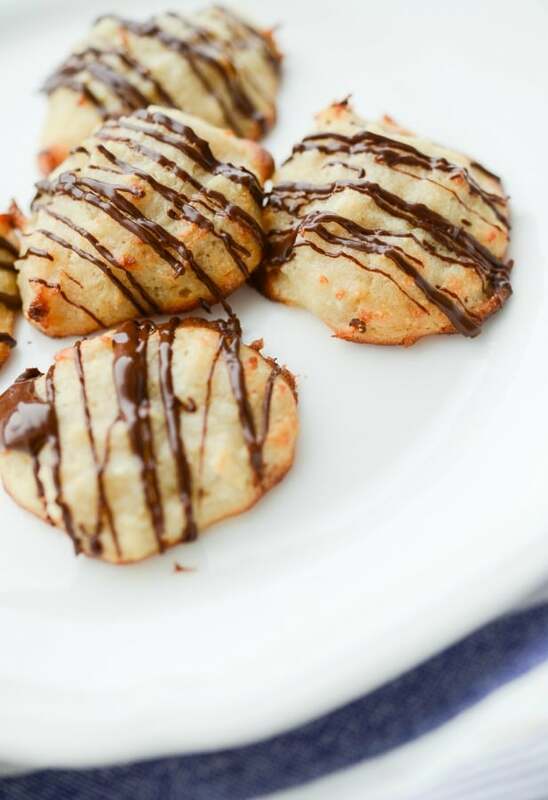 These coconut macaroons are the perfect treat for those living a gluten free or low carb lifestyle. ~Enjoy! 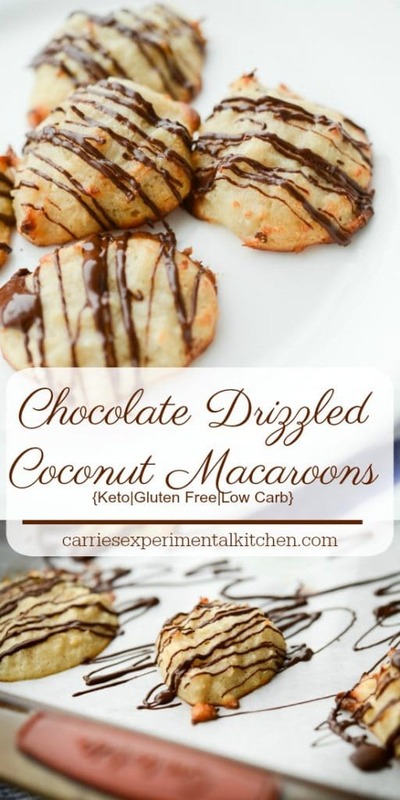 Chocolate Drizzled Coconut Macaroons made with almond flour, coconut and egg whites are a low carb dessert option when you're craving something sweet. Preheat oven to 400 degree F.
Heat the oil until melted; then add the vanilla extract. Combine the flour, coconut and stevia in a mixing bowl; then add the oil mixture. Drop a tablespoon of the mixture onto a non stick baking sheet or one that has been lined with parchment paper or a Silpat mat; then bake for 7-8 minutes until the edges and tops turn golden brown. Remove from the oven and allow to cool completely. 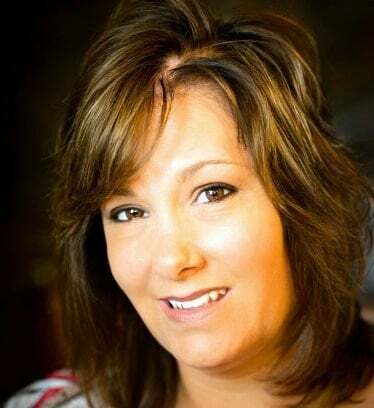 Visit the Recipe Index for more Keto or low carb recipes!